This is a simple measurement with 3 indicators that is given to each team member at the beginning of the retrospective to complete. 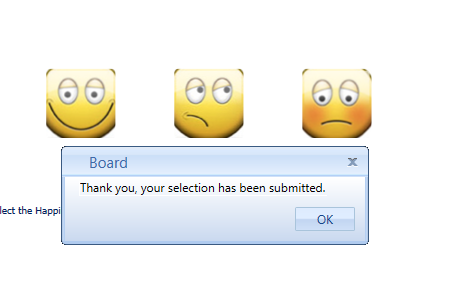 Each team member accesses the voting sheet and selects the team and submits their response for the day. The response is recorded against the Jira user logged in. The curve is monitored per time period and provided to the team as a status check. The Scrum Master is also responsible for prompting the team to discover issues during the retrospective if a downward curve is experienced. 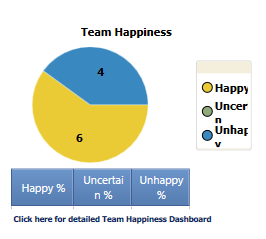 On the Team Happiness dashboard the following over view of where the people happiness measure is sitting can be reviewed. A specific gadget on the dashboard enlarged.